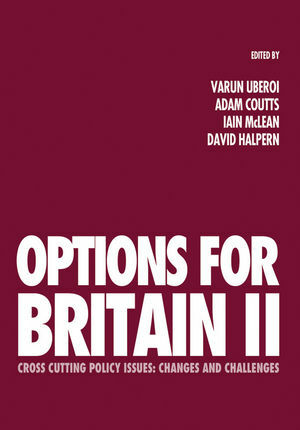 Options for Britain II: Cross Cutting Policy Issues - Changes and Challenges offers an assessment of the last decade of British public policy that cuts across policy areas, such as measuring public sector performance, the role of the state, regulation, and Britain’s relationship with the EU. Varun Uberoi is a Postdoctoral Research Fellow in the Department of Politics and International Relations, Oxford University. Adam Coutts is a Postdoctoral Research Fellow in the Department of Politics and International Relations, Oxford University. Iain McLean is a Fellow of the British Academy and Professor of Politics in the Department of Politics & International Relations, Oxford University. David Halpern is Research Director at the Institute for Government and was Chief Analyst in the Prime Minister's Strategy Unit (2001-2007). Introduction (Adam Coutts and Varun Uberoi). 1. Options for Britain: Measuring and Managing Public Services Performance (Christopher Hood). 2. The Future of the State (Matthew Flinders). 3. Social Justice and Inequality in the UK: Eradicating Child Poverty? (Peter Kenway). 4. Social Mobility: Concepts, Measures and Policies (Jo Blanden). 5. The Tax System under Labour (Paul Johnson). 6. Regulation, Equality and the Public Interest (Shamit Saggar). 7. Gender Analysis of Transfer Policies: Unpicking the Household (Fran Bennett). 8. Options and the Lack of Options: Healthcare Politics and Policy (Scott L. Greer). 9. Entrepreneurship and Innovation Policy: Retrospect and Prospect (Alan Hughes). 10. Information Exchange between Government and Citizens (Helen Margetts). 11. Options for Britain: Europe (Patrick Diamond and Roger Liddle). 12. Global Poverty and Inequality: A Brief Retrospective and Prospective Analysis (Michael Woolcock).